Like all the broad genre terms of metal, “Doom” covers a lot of ground, so much musical landscape that the term by itself gives only the sketchiest of clues about what you may be about to hear. But even the more specific sub-classifications of the genre really don’t fit the unconventional twists and turns of the song by Ever Circling Wolves that we’re now presenting to you. 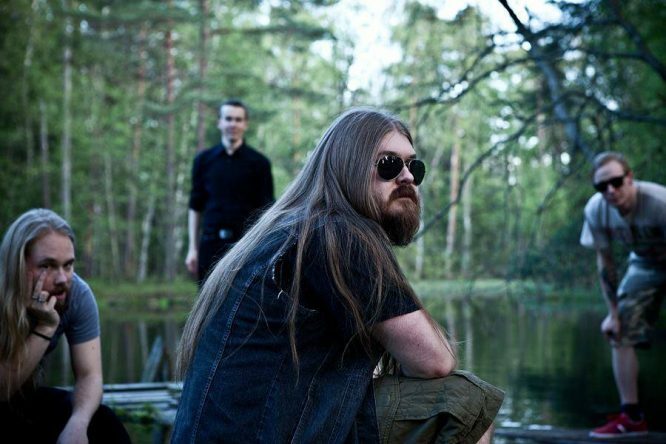 The name of the song is “Lenore“, and it comes from this Finnish band’s second album, which bears the wonderful title Of Woe or: How I Learned to Stop Worrying and Love the Gloom. It will be released on January 27 by Colorado-based Cimmerian Shade Recordings. 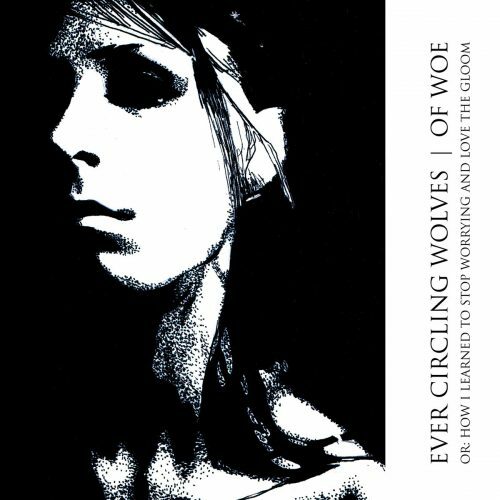 2017 marks the 10th birthday of Ever Circling Wolves, with a long six years since their self-released debut album The Silence From Your Room, though a two-track EP appeared in 2011 — with the title Chapter III: In Which the Protagonist Finds Himself at the Bottom of the Ocean as well as in a Petrified Forest — and a Live @ Studio EP in 2012. “Lenore” does hurt some. It’s doom-ish, but hardly any kind of conventional doom, and that’s part of what makes it a very interesting experience. The mid-paced beginning, with its groaning, jabbing riffs and high, wailing lead guitar do give an early doom flavor to the music, but the first twists and turns don’t take long to arrive, with half-spoken, half-sung vocals theatrically expressing the lyrics. Harsh growls lie further ahead, along with chugging riffs and lurching rhythms, a beefy bass line, and sharp, bone-snapping drum progressions. The dark cast of the music grows deeper, and the lead guitar melody becomes not merely dismal but also kind of queasy. But the really big twist comes about halfway through when the pace changes, and the song begins to noodle and meander with a jazz-like flair, the warm-toned bass and shining cymbal work getting their chances to shine. In this surprising segment, multiple clean voices can be heard, and there’s an almost psychedelic tinge to the ringing arpeggios. As the song increases again in heaviness and vibrancy, there are more clean vocal harmonies as well as progressive instrumental development, and in the final minutes the rhythm section locks into a repeating groove and the lead guitar chimes like tubular bells. And in a final twist, the song segues into a layered acoustic guitar finale with a lilting folkish charm. Well, I guess I’ve spoiled the surprises for those who’ve read these words, but I couldn’t think of a better way to explain just how unexpected and interesting the song is, and how unconventional this particular approach to doom turns out to be.